My husband and I went on vacation to Seattle last week – without the kids. It was awesome. Despite warnings of an incoming “storm of historic proportions”, the wind and rain weren’t nearly as bad as some had predicted and Seattle pretty much continued business as usual. And we were on vacation – without the kids. We weren’t about to let the weather keep us from thoroughly enjoying ourselves. I love my kids dearly but, every once in a while, it’s nice to be a little carefree and not have to be responsible for anyone but yourself. So, we walked and ate and stayed up and slept in and laughed and repeated it all again every day for a week. Of course, no first time visit to Seattle is complete without frequenting coffeeshops and walking through Pike Place Market. I fell in love with the flower vendors and wistfully yearned to buy armfuls of the huge, gorgeous $10 bouquets of dahlias. I also became slightly obsessed with all the neon lights at the market. Fortunately, my husband was sweet enough to walk with me through the market at all hours of the day and night to keep watch for cars as I stood in the street to get the perfect shot. And neither of us could resist the seafood. Since we were staying at a hotel, we couldn’t exactly buy fish at the market to cook in our room. So we did the next best thing. We bought some wild king salmon and dungeness crab at the market and had it shipped overnight to us so we could cook it at home. 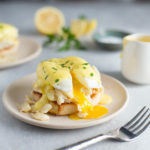 Crab eggs benedict is a recipe we have been wanting to make for awhile. We first had it 15 years ago at a hotel in Sausalito we were staying at for a wedding. We ordered it for breakfast the first morning and then ordered it again for breakfast every morning we were there. It was that good. We were never able to get the hotel restaurant to share their exact recipe but I think our version is pretty darn good too. Honestly, how could a combination of crab, runny yolks, and lemony hollandaise sauce not be good. Eggs benedict can seem intimidating because poached eggs and hollandaise sauce have a reputation for being difficult to make. However, with a little practice and some key tips, you’ll be mastering both in no time. I go into a detailed discussion about the technique I use for poaching eggs in this post. If you’re still working on your egg poaching technique, you might want to hop over to that post for some helpful hints. In regards to the hollandaise sauce, the key to a smooth sauce is to use very, very low heat and to whisk the sauce constantly as it cooks. The idea is to smoothly blend the ingredients together and gently cook the egg yolks so they thicken the sauce without becoming cooked scrambled eggs. If you have problems controlling the heat on your stove, try putting the saucepan on the heat just long enough to warm the sauce and then take it off the heat, repeating as necessary while cooking the sauce. In a small, heavy saucepan whisk the egg yolks and 1 tablespoon lemon juice together until combined. Set the pan over very low heat and add 1 (4 tablespoon) portion of butter. Cook the mixture, whisking constantly and allowing the butter to slowly melt and incorporate into the egg mixture. Remove the pan from the heat occasionally if the pan gets too hot and eggs begin to curdle. When the first portion of butter is incorporated, add the second portion. Continue cooking and whisking until the butter is melted and the mixture thickens. Taste and add more lemon juice to taste. Keep sauce warm while preparing the eggs and crab (see Notes). Lightly toast the English muffins, then keep warm in the oven. Meanwhile, in a small sauté pan, melt the butter over medium heat. Add the crab and lemon juice. Heat the crab gently until warmed through. Set aside. For the eggs, crack the eggs into 4 small ramekins or sauce dishes. In a 12-inch straight-sided skillet or large saucepan, bring 3 inches of water to a simmer. Turn down the heat so that no more bubbles form on the surface. Carefully slide the eggs into the water, evenly spreading the eggs around the pan so they don’t touch each other. Cook eggs, undisturbed, until white is just set and yolk is still runny, 3 to 4 minutes. Use a rubber spatula to gently release eggs from the bottom of pan, if necessary. Using a slotted spoon, remove eggs from water and set them on a paper towel lined plate. Place muffin slices on plates. Top each muffin slice with a quarter of the crab mixture, a poached egg and some of the sauce. Season with salt and pepper to taste and garnish with chopped parsley if desired. Serve immediately. To keep the sauce warm, you can set the pan over extremely low heat or over a pan of hot (but not simmering) water. You can also transfer the sauce to an insulated travel mug (like a Yeti cup). Whisk the sauce occasionally to keep it smooth. For another variation, you can add some thin avocado slices between the English muffin and the crab meat. This recipe yields 4 English muffin slices topped with crab, eggs, and sauce. This can serve 2 people with hearty appetites or 4 people with lighter appetites.